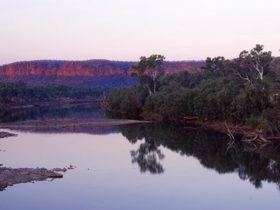 The scenic Victoria River area, located south-west of Katherine, is home to one of Australia’s last wild rivers. The Victoria River teems with fish and other unique wildlife and is a popular fishing destination. 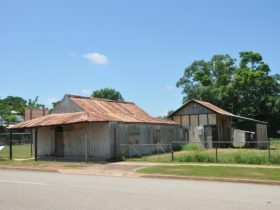 The small, historic township of Timber Creek is located on the Victoria Highway, 285 kilometres west of Katherine. Gregory National Park sits at Timber Creek’s doorstep, covers around 13,000 square kilometres, and is home to a wide variety of flora and fauna. Some activities to be enjoyed include escarpment walks, four-wheel driving, swimming, boat cruises and bird watching. A sunrise or sunset river cruise lets travellers see the river and its surrounds, and offers a chance to view the park’s diverse wildlife. 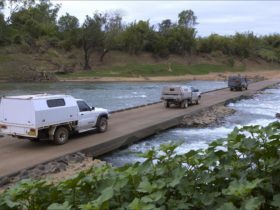 Situated 170 kilometres west of Timber Creek is Keep River National Park. This park encompasses towering sandstone landforms and Aboriginal rock art and is best explored on foot following one of its many bushwalking trails. The Victoria Daly area is a local government area (LGA) in Northern Territory. This area is home to 21 locations and/or suburbs which you can explore in more detail by selecting from the list below. The Victoria Daly area is located approximately kms from the capital Darwin.